Ben & Jerry's announced their newest ice cream flavor which sounds anything but appealing. 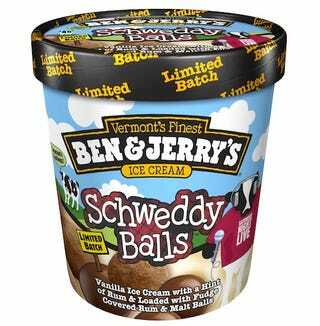 Schweddy Balls is the best they could come up with. The vulgar new flavor has turned something as innocent as ice cream into something repulsive. Not exactly what you want a child asking for at the supermarket. The post also mentions that they're still offended about last year's Hubby Hubby flavor that celebrated gay marriage. They conclude, "It seems that offending customers has become an annual tradition for Ben & Jerry's." Ben & Jerry's responded that they aren't out to offend anyone they just like "having some irreverence and having some fun ... Our fans get the humor." In other words, no one cares if conservatives don't like the ice cream. That just means more Schweddy Balls for the rest of us.